Ballroom dance is a set of partner dances, which are enjoyed both socially and competitively around the world. The dances are divided into Standard (quickstep, English and Viennese waltz, ballroom tango, slow foxtrot) and Latin dances (samba, cha-cha-cha, rumba, paso doble and jive). The term ‘ballroom dancing’ is derived from the word ball which in turn originates from the Latin word ballare which means ‘to dance’ (a ball-room being a large room specially designed for such dances). In times past, ballroom dancing was social dancing for the privileged, leaving folk dancing for the lower classes. These boundaries have since become blurred and ballroom dancing is practiced by a wide range of people around the world. At the USC, lessons are divided up into beginner, semi-advanced and advanced. 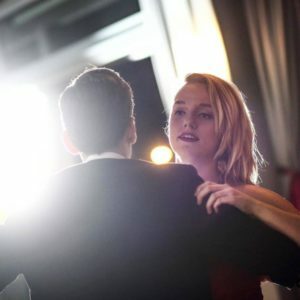 Ballroom dancing is, when done at a high level, one of the most physically demanding types of dance – it really puts the ‘sport’ into dancesport. For the Advanced and the Very Advanced class a dance partner is needed. Haven’t you got a partner yet? We can help! This winter we will organise a ‘dance partner dating round’ for our members to find a suitable dance partner. And besides that you can always come to our Social Dancing evenings. We hope to see you on Wednesdays for the dance classes!